Massive 120mm fan draws heat as it builds up from the processor area and cools the power supply at the same time. Special slippery circular tube design fan-guard allows air to flow in smoothly and quietly while providing protection against unintended installation injury. Does NOT support Bitcoin, Ethereum, and other crypt-currency GPU mining none-standard PC operation. 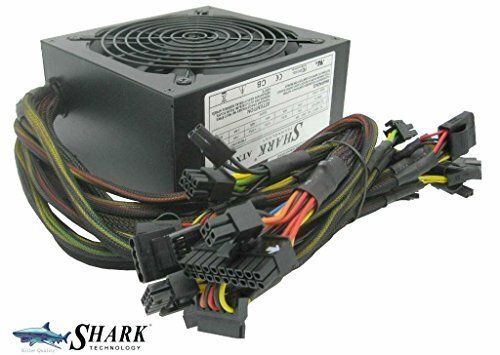 1200-Watts peak output, designed for gamer DIY or Multimedia application. Energy-efficient: typical 84.65%, average 82.81% efficiency. Low heat & Low noise operation with silent thermostat-controlled variable speed smart fan. Active PFC for reduced harmonic distortion. 8x SATA and 4x PCI-Express 6+2 pin power connectors. Use of PCIe splitters or molex-to-PCIe power adapter cables is not recommended. If you have any questions about this product by SHARK TECHNOLOGY®, contact us by completing and submitting the form below. If you are looking for a specif part number, please include it with your message.